Sedgwick brewery feels like a party in a friend’s yard. Because it is. 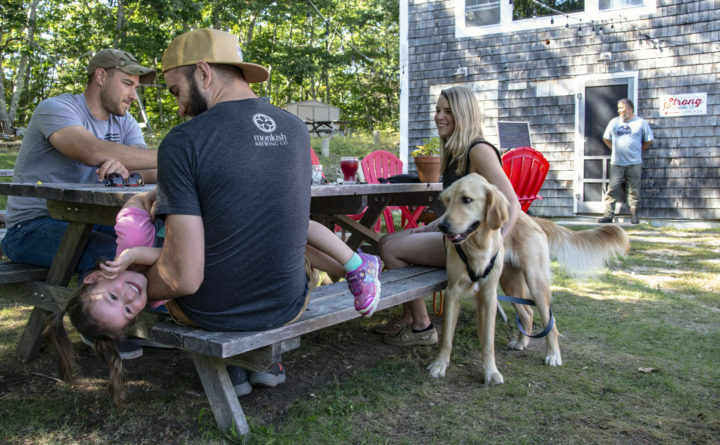 Three-year-old Charlotte Nale had a good time with her father Ken [left] and Charlie the Golden Retriever at Strong Brewing Co. of Sedgwick. Owner Al Strong is to the rear. The microbrewery has an ordinary yard that people enjoy. 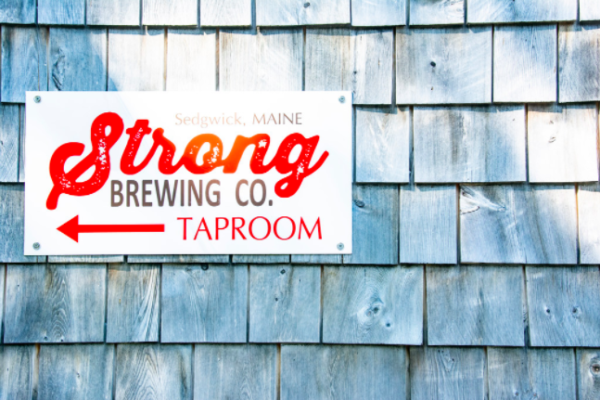 SEDGWICK, Maine — Al Strong wants a visit to his microbrewery to feel like a picnic in a neighbor’s yard. He has three strings of lights strung overhead. Red plastic lawn chairs circle a metal fire pit near several picnic benches. Pets are welcome, and so are children. Parking is available in a patch of dirt across the road. The trees are thick and the houses sparse in the woods around Strong Brewing Co.
Then there’s Hazel the hen. Strong didn’t create Strong Brewing out of any grand design. It features a front yard because it happens to be in a front yard. Mia Strong of Strong Brewing Co. of Sedgwick chats with customers Paul and Judi Dow of Columbia, Tennessee. The 52-year-old New Jersey native and former insulation installer started brewing beer at his two-floor home at 7 Rope Ferry Road — it’s the intersection where Route 15 becomes Route 176 and veers toward Blue Hill — about five years ago. Today, the four-barrel brewhouse features a tap room with six taps and 19 brews, plus a new pavilion for bands and other events. Held every Saturday night in summer, the concert series ends this month. 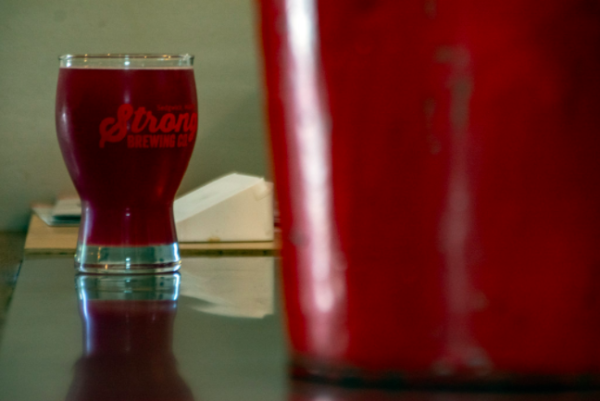 Strong Brew added the pavilion and a lunch truck that comes on Fridays and Saturdays to its offerings in July for about $20,000, Al Strong said. The Strongs started canning their beer in March, adding to the brews they sell to about 40 local restaurants and stores, Mia Strong said. The eateries include the Blaze restaurants in Bangor and Bar Harbor, Barncastle Hotel and Restaurant in Blue Hill, McKay’s Public House and Finback Alehouse in Bar Harbor, Rockland’s Cafe Miranda and The Great Lost Bear, Portland Pie Co., Flatbread and Nosh, all of Portland. Strong Brewing Co. of Sedgwick has been in business for about five years. The microbrewery has an ordinary yard that people enjoy. Having a brewpub a floor below your living quarters does create disadvantages. Customers come knocking at the strangest hours, or on brewing days when Strong Brewing is closed. More than once Al Strong has had to yell out the window to tell people to come back tomorrow, he said. But some customers who arrived during business hours on Friday seemed glad to have made it. Paul and Judi Dow of Columbia, Tennessee, dropped by Strong Brew on their Electric Glide Ultra Classic Harley-Davidson during their vacation in Bar Harbor. Strong Brew’s front-yard layout reminded Paul Dow of the recently-legalized moonshiners of his home state. Dow sampled the Blue Baron, the first blueberry flavored ale he’s ever had, he said. Strong Brewing Co. of Sedgwick offers more than a dozen kinds of beer. Rick and Sarah Leighton of Penobscot brought their black poodle, Frannie, and their golden-retriever mix, Charlie, to Strong Brew. Their friends from New Jersey, Ken and Amanda Nale, had their 3-year-old daughter, Charlotte, and 7-month old son, Kenny, with them. Rick Leighton liked the down-to-earth vibe of Strong Brews and its diverse portfolio of beers and ales. He said it forms a nice contrast with a nearby microbrewery, the more upscale Deepwater Brewing Co. at Arborvine Restaurant of Blue Hill, also a converted residence. 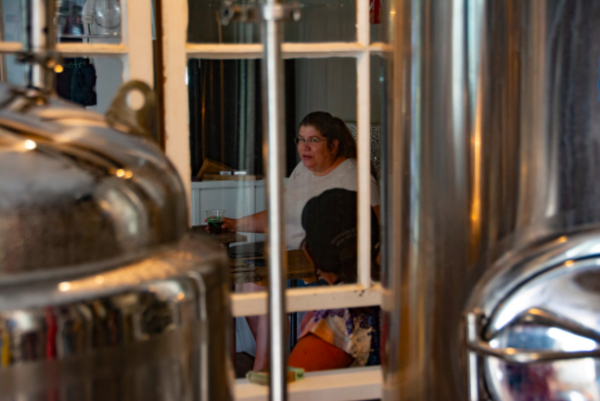 With summer fading and the canning operation figured out, the Strongs say they will shift the emphasis of their business over the winter, when things slow down. About 60 percent of their produce goes into beer kegs and 40 percent into cans. They plan to reverse those percentages and try to sell to more stores while keeping their restaurant clients well-stocked, Mia Strong said. Follow BDN Hancock County on Facebook to get all the latest Hancock County news.